Born in Dayton, Ohio, Leigh Waltz took drawing lessons at an early age. In high school, he traveled through Europe and spent a year on the island of Borneo. There, he learned photography and darkroom techniques with Amarjit Singh, a local photographer. He lived in Vienna and Amsterdam with a painter and a photographer, and then returned to study at the Art Academy of Cincinnati. After earning a Bachelor’s degree (cinema studies) at Columbia College, Hollywood, California, he worked for two years in the movie industry, then served in the US Navy, later joining its reserve force. In 1999 he enrolled in the Master of Fine Art program at the University of Cincinnati focusing on printmaking. In 2000, recalled to active duty, the Navy posted him to Vicenza, Italy, for nine months. During that time, he visited world-class art exhibitions in Venice, Florence, Milan, Rome and Turin. Once back home, he created Sinclair Community College’s “Gallery of Innovators” permanent skywalk installation (2001), and returned to Europe for the Venice Biennale and ArtCologne. Waltz completed his MFA degree in 2002 and has been teaching art since at Sinclair Community College, interrupted only by a 6 months deployment in Iraq. His work hangs in the US, Italy, and Germany. Waltz recently started learning about Permaculture, Transition Culture and how to farm without using the chemistry of “conventional agriculture.” He believes it is important to grow food and reconnect with the soil, that this will become the number one activity and educational need of the next generation and that the future belongs to those who can fix things and grow/raise food the traditional way. Current food production, including planting, harvesting, processing and moving the crop, has become so much dependent on oil and on petrochemicals such as fertilizers and pesticides that with the predicted soon depletion of oil reserves (oil peak) conventional crop yields would most likely drop to about half. In order to become sustainable and avoid future food scarcity and resulting famines, these activities would need to revert to a smaller, more local scale, rehabilitating the soils to their natural productive state through the use of vermiculture, compost and manure. 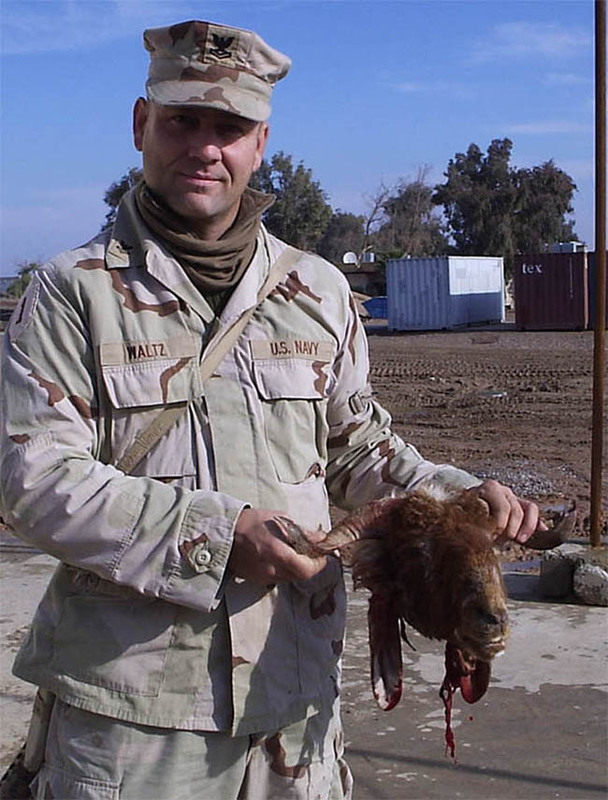 Waltz was one of the navy’s petty officers in Iraq. Prompted by his art education and his background in live art, he held a feast for “his” Iraqi workers on the day after Christmas, 2004. It was actually a performance piece entitled The Feast of St. Stephen. Similar in spirit to the work of contemporary artist Rirkrit Tiravanija whose installations often take the form of stages or rooms for sharing meals and cooking in order to promote living and socializing, Waltz’s performance feast brought together more than forty people (including Kurds, Arabs and American military) who connected, socialized and shared a meal of fresh mutton “a la Iraq”. 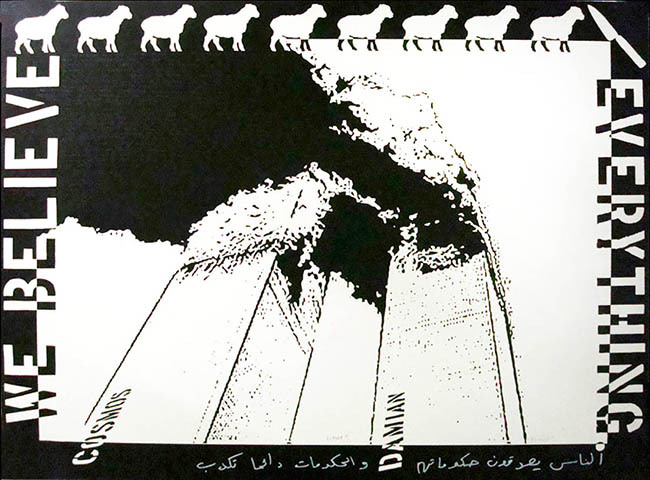 In the title of one of his artwork depicting the twin towers of the World trade Center in Manhattan, artist Joseph Beuys playfully dubbed them as Cosmos and Damian, the names of two Saints who were healers. On September 11, 2001, airplanes hit the two buildings which collapsed on their own footprints. Waltz thinks that everything told to us about 9/11 is what we would rather believe but that the truth in reality is quite different. He wrote his questions, doubts and fears in graphite in the smoke shown in the background of his mixed media piece. Waltz is of the firm opinion that when the media become totally owned by profit-seeking and power holding interests, it is the duty of artists, poets and musicians to stand up for the truth. Actually very few choose to talk about resource depletion, the most unlikely being the politicians and economists. 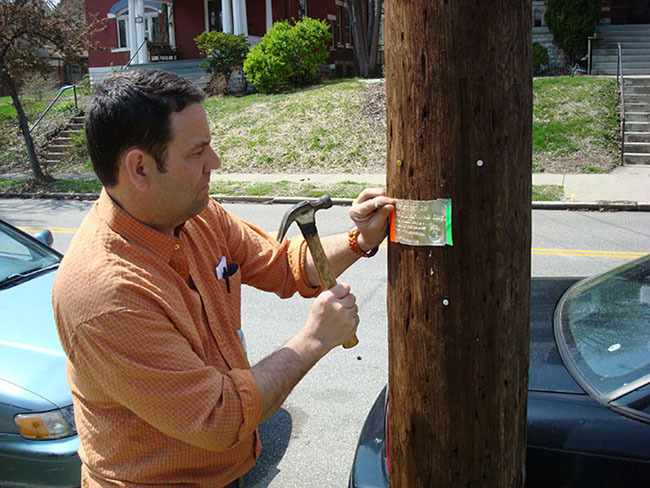 Waltz is here nailing to a telephone pole a die-stamped recycled aluminum on which he wrote a message about the end of oil and its dire consequences for a world that depends primarily on it. He hoped that someone would take notice and learn from it. He soon realized, however, that most people were too busy to care or pay attention; and that the few who did, unfortunately, most of the time “protected” themselves through denial. Waltz thinks that consumerism-dominated media really controls people’s minds and feeds them with a convenient falsified truth. 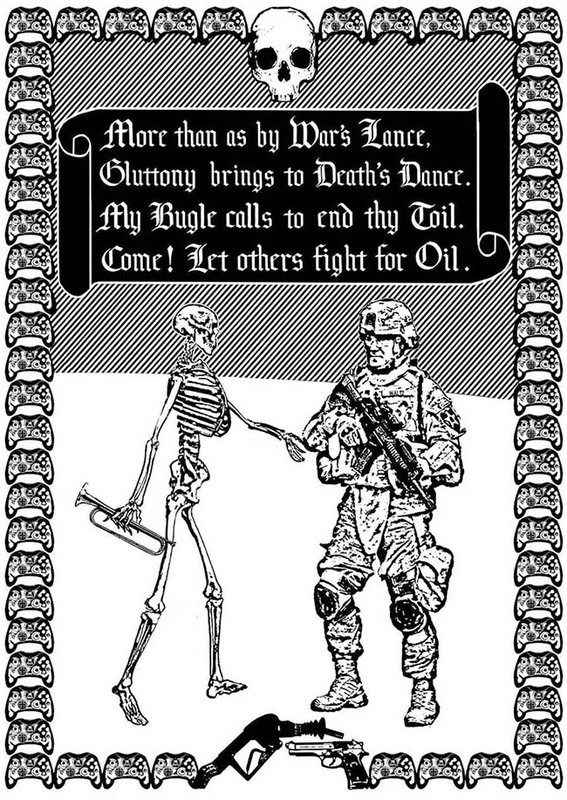 Death and the Soldier is one of the many pages of Waltz’s book, Dans Macabre ad hoc Petrocollapse. The work is a poetic cross between medieval imagery related to the Black Death (dance macabre) and the consequences Waltz sees because of Peak Oil and the foreseeable soon depletion of oil. He finds the bubonic plague in Europe to be the only comparable mega-death in human experience. The complete version of his book can be freely downloaded as a PDF at http://guymcpherson.com/wp-content/uploads/2010/12/Dans-Macabre-ad-hoc-Petrocollapse.pdf. Bread is a year-long performance piece started by Waltz. It involved sowing a crop of wheat and rye, making an earth oven, harvesting and processing the grain by hand, baking bread, eating it with friends and relatives and completing the mineral cycle by pooping on the field. 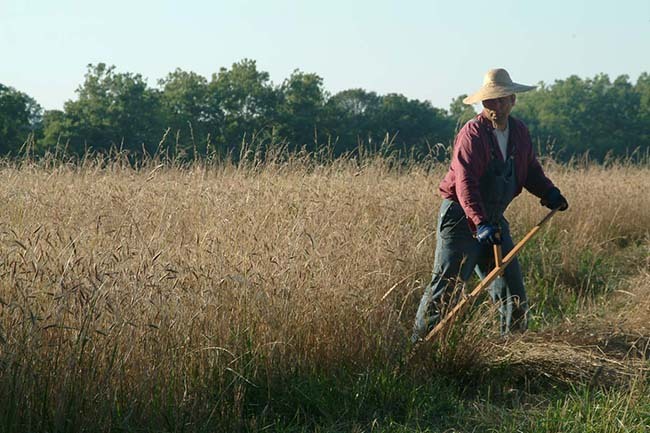 Waltz’s father helped sowing the crop. Waltz meant it as a commemoration and a celebration of Grain culture, once a unifying, family-strengthening, community-building and earth-connecting practice. 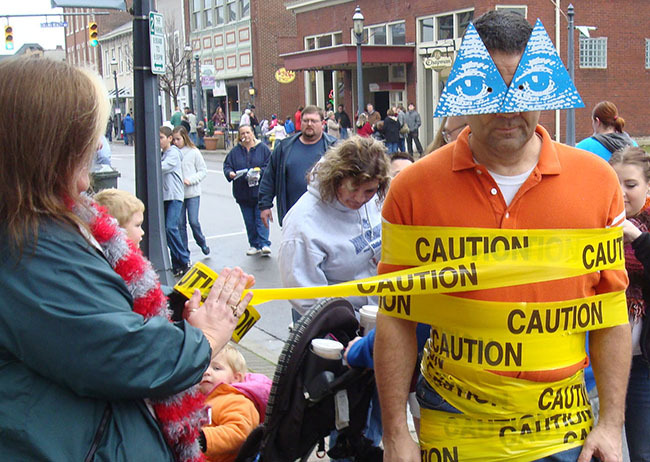 In his live art piece Reckless Awareness, Waltz wears “all seeing eyes” and asks passers-by to wrap him in caution tape until he cannot walk. In learning about the trends of “civilization,” and attempting to discern truths, the artist comes to realize that his understanding often separates him from the typical citizen and places him in the role of visionary, seer, or prophet, attributes not always comfortable or even welcome. The translation of this experience is the essence of Waltz’s piece. It depicts the artist on the edge… in the moment of realizing truths may be untranslatable, subjective or may even demand abandoning many of the values held by the typical citizens. The artist, therefore, needs to proceed with caution! Through his performance Waltz attempts to bridge a gap and open a dialogue. He addresses for instance the issue of resource depletion which divides the population into at least two groups: the ones who believe everything is fine and that technology will rescue and maintain the consumerist lifestyle so that “business as usual” can continue forever and the others who see the need for adaptation in anticipation of scarcity. The piece also parallels the rift between material and spiritual, the typical citizen usually not concerned with an “unknowable” future and concentrating on accumulating wealth and belongings, while the spiritually concerned focusing on what comes after the seeable and tangible no longer hold sway. Talking Buddha, Talking Gandhi and Talking Christ, made of discarded aluminum, represent imprinted images of Buddha, Gandhi and Christ, with hammered quotes from their writings. Creating them was for Waltz an experience of meditative art-making. He wanted their end products to convey and commemorate the three men’s highest ideals. Gandhi’s quotes were taken from his autobiography, My Experiments with Truth, a book that strongly impressed Waltz by its powerful presentation of faith and courage. Waltz also depicted Christ because he thinks that, regardless of any religious perspective or belief, the image of Jesus is an amazing, awesome and challenging one. Jeffrey Hillard is an award-winning author, publisher, teacher, and literary advocate. He is the author of four books of poems, a chapbook of short stories, and currently is publisher and editor of an online magazine, RED! the breakthrough ‘zine (www.redwebzine.org). RED! is devoted to sharing stories of positive transformation in the lives of prisoners and formerly incarcerated individuals internationally, as well as stories of innovations and innovative people in the world of criminal justice. Hillard is a recipient, among many other awards, of the Post-Corbett Award for Literary Artist (1993), the Sister Adele Clifford Award for Teaching Excellence (1998), Ohio Arts Council Artist in Residence (2000) at the Provincetown Fine Arts Work Center (Cape Cod, MA). He is the co-founder of Cincinnati Writers’ Project (1988), editor of the former Cincinnati Poetry Review, as well as of three poetry anthologies. Hillard is currently associate professor of English at the College of Mount St. Joseph, where he has taught in the Division of Arts and Humanities since 1987. 1. Hillard has always been entranced by the power of the Ghazal form of poetry and has written a good many ghazals over the years. The ghazal is an ancient form likely originating in the sixth century in the Arabic language and, in ancient times, a common poetic form embraced by Persian mystics. A ghazal often resembles an English or American “hymn,” in the sense that it has a vibrant oral quality and is often sung. As can be seen from the end-rhyming and the end-phrasing of the second line in each couplet of the poem, the ghazal actually follows a strict form – yet, it is a very liberating kind of poem to write. It was popularized in recent years in this country by Hillard’s former teacher, the late Agha Shahid Ali, who was originally from Kashmir. This particular Ghazal poem deals with Hillard’s impression of a beautiful place near the eastern-most point of the US. When I dry from the sun, I’ll never again be revealed upon water. It’s either evening or late afternoon when empty bottles float by. The kiss I don’t receive is stranded, like a mirror upon water. Absence composes the gray shore where I walk. A wind once dropped shell fragments like tears upon water. When she touched me, what faded was the need to remember. I can be lead to shade and be taught nothing is bleak upon water. Where are they going? Why does a family wrap towels around sand castles? Where wet cold rocks roll is a shadow smeared upon water. She left first; now I’m enthralled by land lapping the sea. And although I do, there’s nothing I should find clear upon water. I can tell when stars cut deep into our thoughtless hearts. I’m never pleased with endings, knowing I could leave upon water. I dream that I’ve failed to remember how to watch birds. The sailboat dips – and slashes – all but retreating upon water. I’ve received all the light I need given to me by the tired sky. Out of such light flows a lost dream upon water. 2. When he lived for a summer in Provincetown, Massachussetts, Hillard was positively floored by the visual art that permeated the community and all of Cape Cod. He was particularly impressed by the work of visual artist Susan Baker, whose “museum” in Truro, a town next to Provincetown, he visited often. Hillard found her art to be eclectic, radical, visionary, and to come in many forms. The following Ghazal was inspired by both her artwork and the small museum itself. at the Susan Baker Memorial Museum, Truro, MA. Suddenly there is snow but no end to a black moving skyline. A window hatches new ice against a black moving skyline. Those pedestrians are dumbfounded, snow-bitten, their coats threadbare. Her oils of French suns, to them, give a less stark moving skyline. Deep inside one painting a woman’s eyes forgive pigeons. During work, she leaves coffee cup rings like an arced moving skyline. Last month two power lines, heavy with ice, toppled on a sidewalk. In her Truro house, Paris light is a flat moving skyline. Long periods of silence open the white streetscape to a lone dog. Little remains vague when she casts her partial moving skyline. A tree against a dune, small table in a field – her colors magnify. The Bay, gray in March, is low in the crowded moving skyline. Light strokes drift from view in the dead of winter. She awaits summer when coastal stars are a larger moving skyline. It’s impossible to know if the roof will hold in this wind. She leaves love in each brushstroke, her hand in transition. Come Spring, grass will inspire awe in such a dark moving skyline. 3. During the time he lived in Provincetown, Massachussetts, Hillard was enthralled to see such a small coastal town populated with so many dogs. It seemed as if a majority of residents owned a dog or two. The free verse poem, Dogs in Provincetown, came to him after he witnessed a man, seemingly emotionally overwrought one day, walking his terrier. He seemed alone and adrift in whatever downcast mindset he might have been enduring. Hillard felt as if his companionship with his dog would eventually help bring him out of his dark mood at this particular time. table-high to fill themselves with the box lunch. The man’s sad eyes. His chin stubble. His lover gone. Dog hair his fingers sift. The paw he rubs. This morning there was mist to fog to mist. a clump of sand the sea could not move. as if putting out a fire. His chewed fingernails. A hand all paint-speckled. His neck vein runs blue until it disappears. The streets rise to a sky made of wood. with shingle cracks like flirtatious bony fingers. His untied shoes. The waves grazing. have a leg-lifting party on a sculpted shrub. the terrier tongues the man’s salty hand. last night out of his mind. a crack in the wood can endure. The dog’s tongue. The paw he holds now. He’d breathe it in if he could. 4. The poem “Bring Mother” is an elegy that Hillard wrote after he learned of the sudden death of the mother of his best friend. One of the only ways Hillard knows how to respond to life experiences is to write. In the poem, it was important to him to explore certain metaphors, especially those of landscape. The couplet structure accommodated the poem’s language, allowing it space to unfold gently, methodically, and hopefully poignantly, as Hillard did tend to emphasize very key words in each line. Something like the sky thundering. Where lightening is a pillow you cry into. into shock. Everywhere you see her. as fog bursting through dying pines. the rain in a language you can’t. stars in the east. But, on another day, her tubes. the mountains to bring her back. you still want. You know her voice. Regardless of the quietness, you listen.